A family attempts to fight and befriend magical creatures when they are bequeathed an old house. What makes The Last Witch Hunter immediately stand out is the fact that it’s not based on anything. It isn’t often that we’re given a big screen fantasy with a completely original screenplay. There’s usually some book or video game or graphic novel you need to know about to get the full effect. All The Last Witch Hunter was based on are a script and producer/star Vin Diesel’s intense love of all things fantasy. When an ancient Witch Queen attempts to wreak havoc on the modern world, an immortal and mysterious witch hunter named Kaulder (Diesel) is the only one who has a chance of stopping her. But first, he must find a way to tap into his memories from thousands of years ago. What The Last Witch Hunter really has going for it is Vin Diesel. His character isn’t particularly layered and he takes few to no risks with how he plays it, but the result is extremely likeable. Everything he does is exciting. Vin’s Diesel driving a Bentley! Vin Diesel’s wielding a flaming sword! Vin Diesel’s beating up dastardly witches for the greater good! He’s definitely someone you’d want on your team if a rogue Witch Queen ever threatened to destroy your hometown. You’d probably want him on your team for a pub quiz too. For an immortal tough guy, he’s very approachable. Rose Leslie is equally as likeable as Chloe, a witch, dream-walker and bar owner that finds herself helping Kaulder hunt down the Witch Queen against both their of better judgements. Also likeable is Sir Michael Caine as Father Dolan 36th, a priest bonded to Kaulder as his assistant, protector and best friend. The same goes for Elijah Wood as Father Dolan’s future successor, Dolan 37th. There’s just so much to like. Thankfully it’s not likeable to the point of being overly cheery and annoying. It’s just the right amount to make you think, ‘Yes. I am having a good time. This is a good thing. 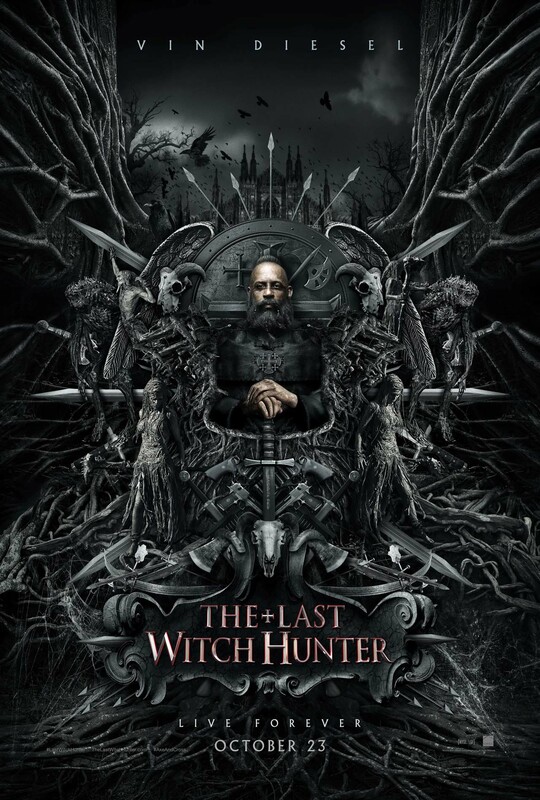 I will soon be ready for The Last Witch Hunter 2’ (which is already in the works, by the way. That’s perhaps a wee spoiler but protagonists don’t die in fantasy adventures with 12A age certificates). The Last Witch Hunter is as likeable as an action adventure fantasy can get. It doesn’t make sense not to like it. It’s just so darn fun. The dialogue can get a bit iffy in places and things occasionally don’t add up, but it’s difficult to care about those kinds of details. This is a film that is literally for everyone. Long time fantasy fans will appreciate the folklore and enthusiasm, and people brand new to the genre will get on with the colourful characters, storyline and marvellous visual effects. Also worth noting is its fabulous production design led by Saw’s Julie Berghoff. It’s cool, kooky and extremely pretty. This is a world many would want to live in, from Kaulder’s fancy, well-equipped New York apartment to Chloe’s atmospheric den-like bar that caters only to the most rock and roll of witches. Overall, the film is accessible, and doesn’t take itself seriously. It doesn’t have the capacity to make anyone feel alienated for not understanding the ways of the witch. It could have very easily become a dark and complicated drama with magical roots centred on an immortal but tortured ‘last of his kind’-type character. That would probably have been interesting, but it wouldn’t have been nearly as fun. A lot of its charm lies in the fact that a whole bunch of crazy happens and there are no rules. It’s hardly groundbreaking but it doesn’t need to be. Check our our red carpet interviews with Vin Diesel, Rose Leslie and Michael Caine here.